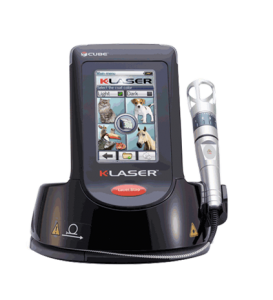 K.Laser – A drug free, surgery free solution for pets? other conditions not listed here? If yes, then K.Laser could be your solution! K.Laser is a small machine that incorporates an infrared laser , which increases cellular circulation, and encourages water, nutrients and oxygen to the painful area. This creates the perfect condition for the cells to regenerate and reduces the inflammation, swelling, muscle spasms, stiffness and pain! The injured area returns to normal, the function is restored and the pain is relieved! In a nut shell, K.Laser encourages the body’s cells to kick start and regenerate, much quicker than they would naturally! The treatment is quick and painless, and requires no restraint or sedation. The area feels soothing and warm to the touch, a similar sensation to when humans use a heat rub on achy muscles and joints! For the majority of conditions, we recommend a plan incorporating multiple treatments. Each treatment lasts between 2-8 minutes each. Within 12-24 hours after a treatment, a patient will be more comfortable and will have increased mobility to the area. Whilst some improvement can be see after the initial treatment, most patients require between 3-8 treatments. For chronic conditions such as arthritis, after the initial treatment plan, either monthly or every other week top up treatments are advised. There have been many published studies demonstrating the effectiveness of the K.Laser therapy. There are more than 100 rigorously controlled, clinical ,scientific studies of the effectiveness of the K.Laser. There are currently only two practices in Cornwall that supports and offers the K.Laser treatment. Here at St. Clement vets in Truro, we regularly have clients referred to us from other practices for a course of treatment. We have highly qualified nurses trained in K.Laser therapy, who will ensure that your pet has the best laser experience possible! Please call the practice on 01872 223400, for more information on K.Laser, or any of our other services.